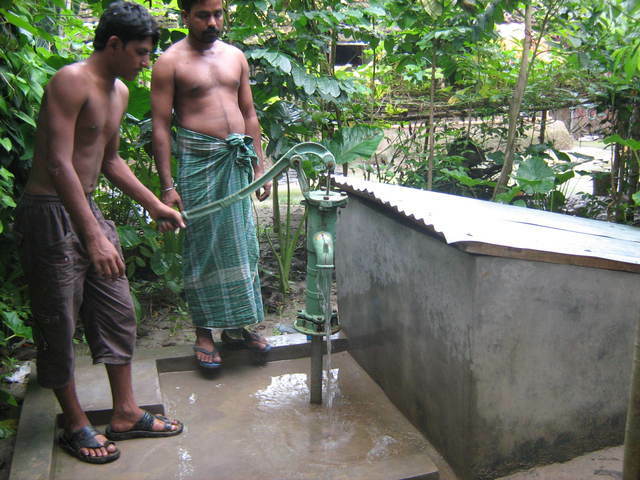 This dugwell # PW109SU20 is located in the Bishnupur village at the Sutia Panchayet in Gaighata. Mr, Bistu Das donated the site for the community. Research and Development is part of the project. The Arsenic level is 7 PPB (BIS stnd is 50PPB)and the date of report October 22, 2009. Bacteria test is pending for water could not be collected on the 26th. Chlorination is done once a week. People are still not using the dugwell water. Next step would be to test the water for bacteria and meet with the potential users and ask them why did they ask for the dugwell if they do not want to use. It is matter of discussion, know their problems and sort them out.